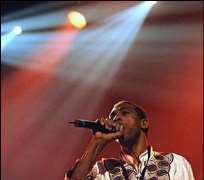 Femi Kuti Authorities in Nigeria have shut the new Africa Shrine, a music venue built and owned by Femi Kuti, a son of the Afro-beat legend Fela Kuti, the family said Thursday. A letter from Lagos authorities dated Monday, accused the Shrine of breaching the state's environmental laws citing "noise nuisance, illegal street trading, indiscriminate parking, blocking of access roads and obstruction of traffic." Yeni Kuti, a dancer and the eldest child of Fela Kuti, who co-manages the club with Femi, said the state government gave the Kuti family 48 hours "to abate the nuisance and restore the land to a conducive environment" but closed the club less than 24 hours after the delivery of the letter. "I'm shocked, indignant. They dropped the note on Monday evening and the next day at 9:00 am they had closed the place," she told AFP. Fela Kuti died of AIDS on August 2, 1997.